As vice president of business development, Russell (Rusty) Smith is responsible for companywide marketing and business development efforts, including growing brand awareness and enhancing customer engagement. Rusty came to LeChase in 2014 as regional director of business development for the Southern Tier region of New York, having previously served as vice president and partner of a construction firm in Ithaca, N.Y. Prior to that, he spent 16 years in business development and management roles at another construction firm in the region. 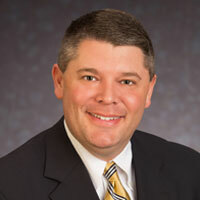 He became LeChase’s corporate business development director at the end of 2016 and was named a vice president in early 2018. Rusty is active in the Corning community, where he serves as a commissioner of the city’s planning board and as a board member of Three Rivers Development and the Corning Community College Development Foundation.